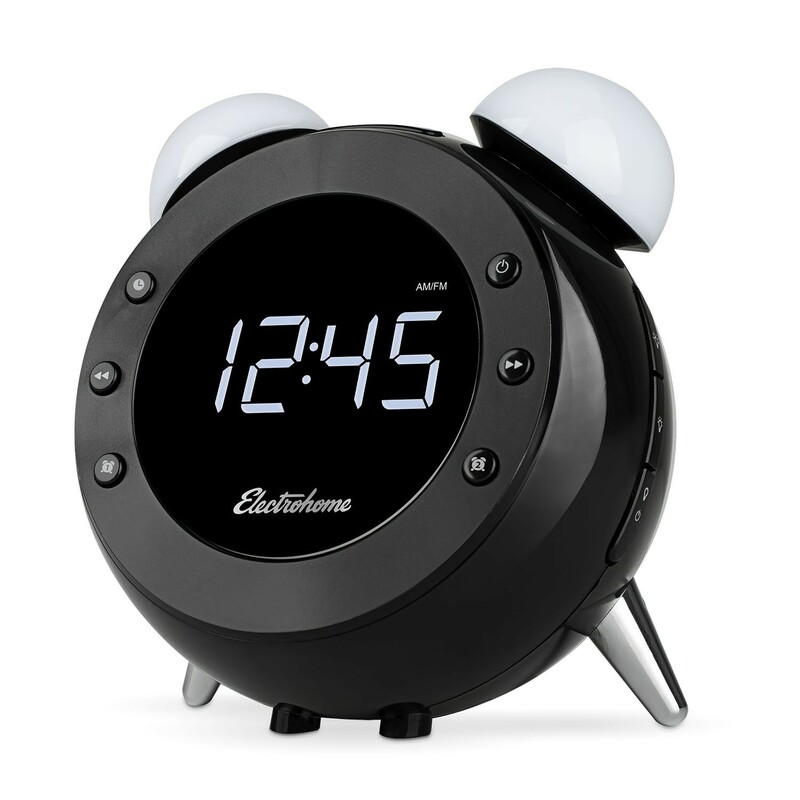 This retro inspired alarm clock brings the vintage appeal of yesterday with modern and useful features for today. 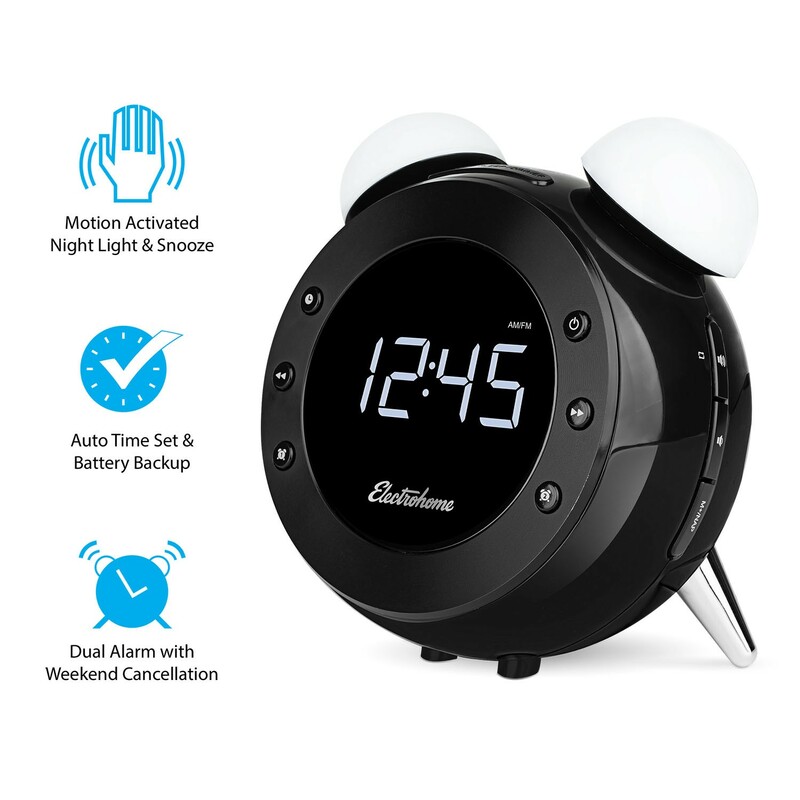 Featured with a circular design and decorated with two bright LED lighting bulbs, this alarm clock will add a timely touch of style to any bedside. Abrupt morning alarm clocks are a thing of the past. Like morning sunrise, this stylish clock gently eases you awake with lighting that gets brighter as your wake up time gets closer. 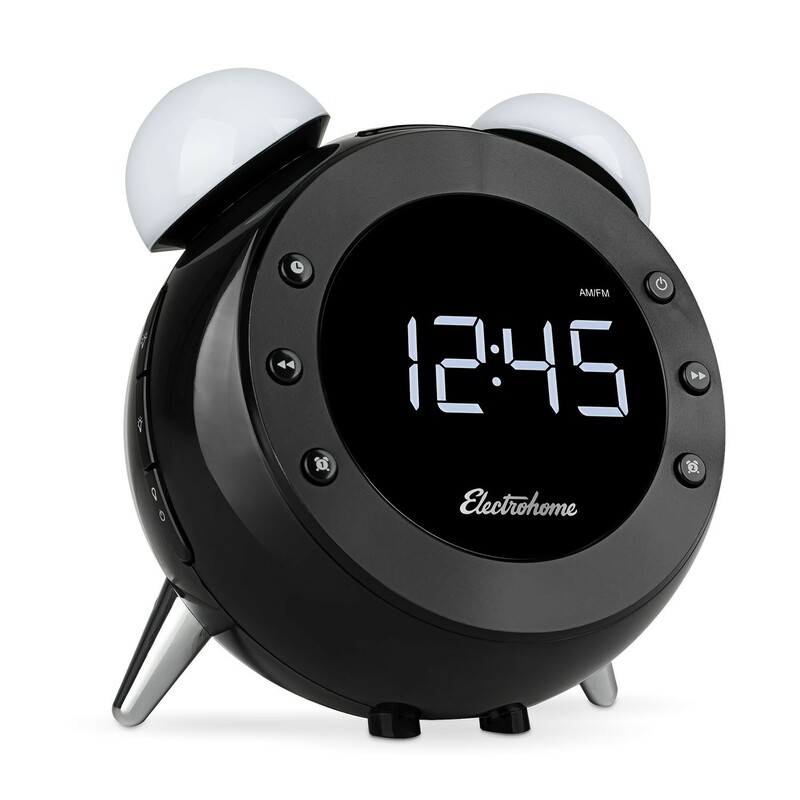 Start each and every day relaxed and fully energized with the help of this retro alarm clock. 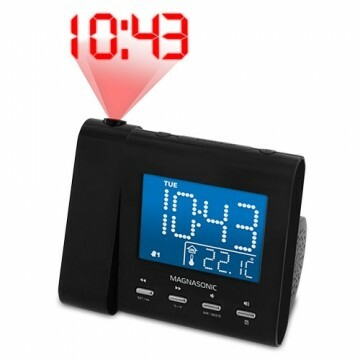 Plugging your clock radio into a wall outlet will display preprogrammed date and time settings automatically. And setting up Daylight Savings Time has never been easier thanks to SelfSet technology: simply specify your time zone and it will automatically adjust each spring and fall. Limited night time visibility can often make for a frustrating experience when searching for your night light switch. 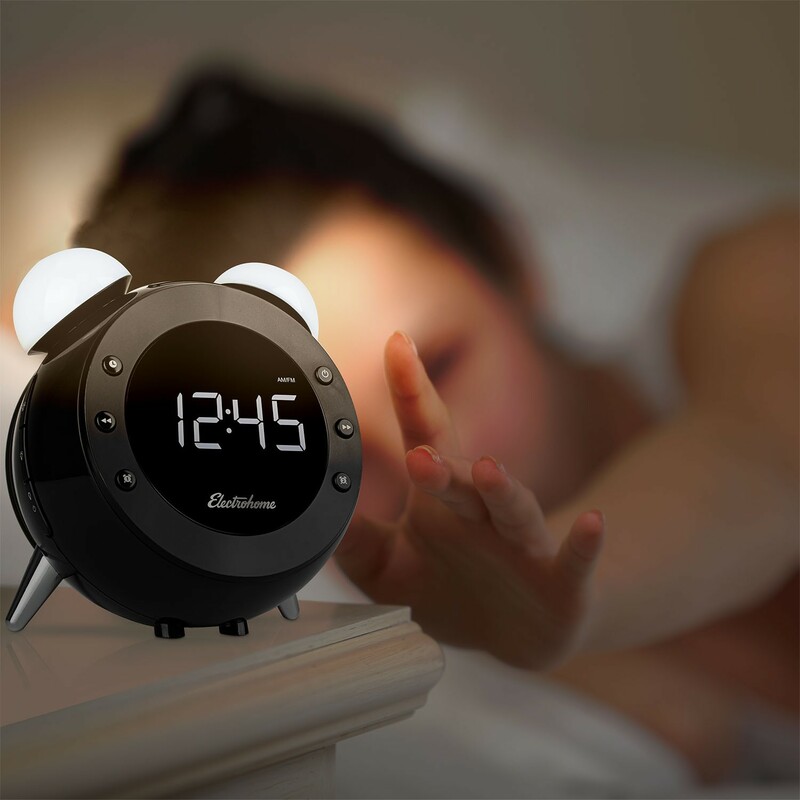 This retro alarm clock will brighten your room by simply waving your hand over the motion sensor. The sensor can also be used to activate the snooze feature on your alarm for those mornings when you need the extra sleep. Whatever your music preference, whether it’s Jazz or Funk, we want you to enjoy your listening experience. Digital AM/FM radio tuning ensures that you’ll always lock on to the strongest point of the radio signal, giving you the best possible reception. 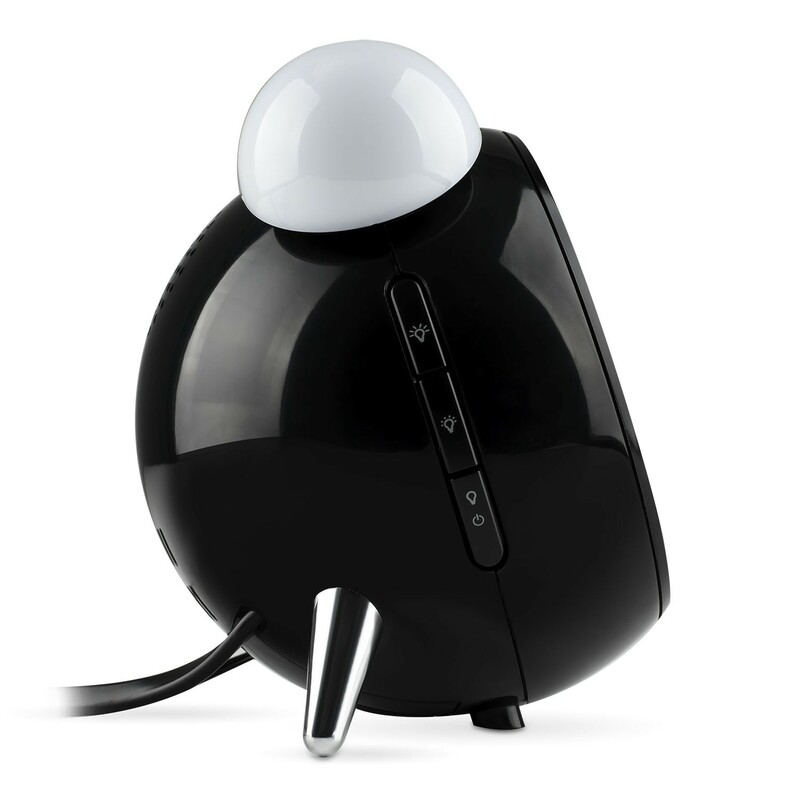 Easy to use electronic controls make programming Program up to 20 radio station presets. and seeking your favorite radio station simple. Sleep soundly knowing you won’t miss a beat if your home experiences a power outage. 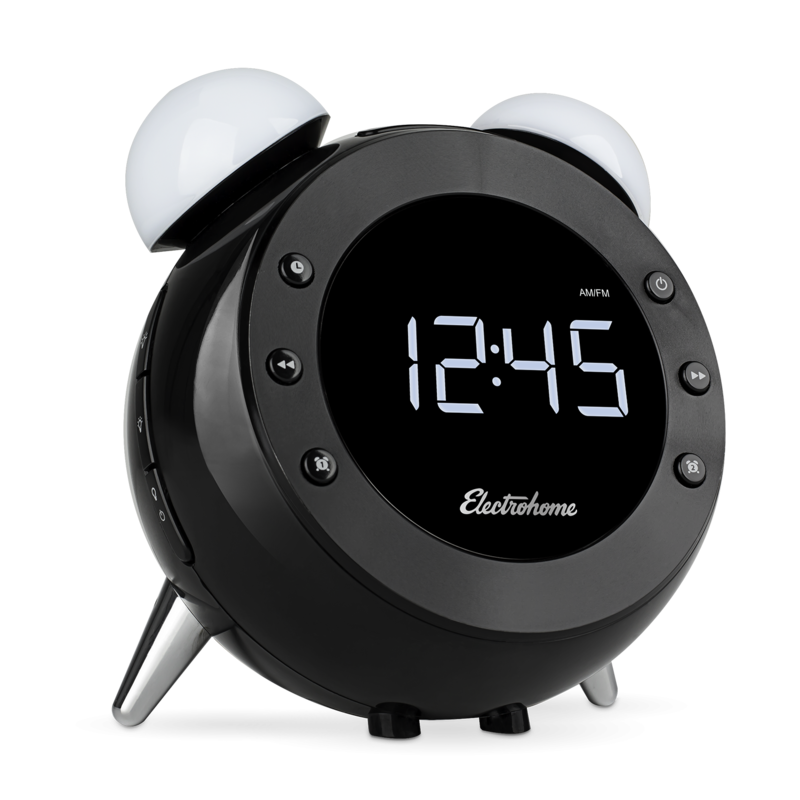 Reliable WakeUp technology means your alarm settings will remain active even through inconvenient power interruptions. 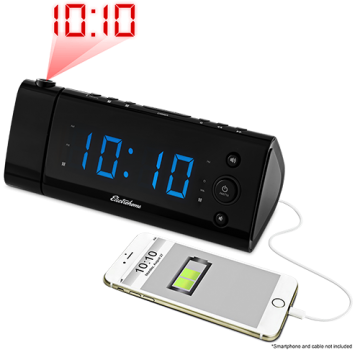 When your wake up time arrives, the built-in battery backup will automatically activate your alarm and provide you with your cue to rise and shine. 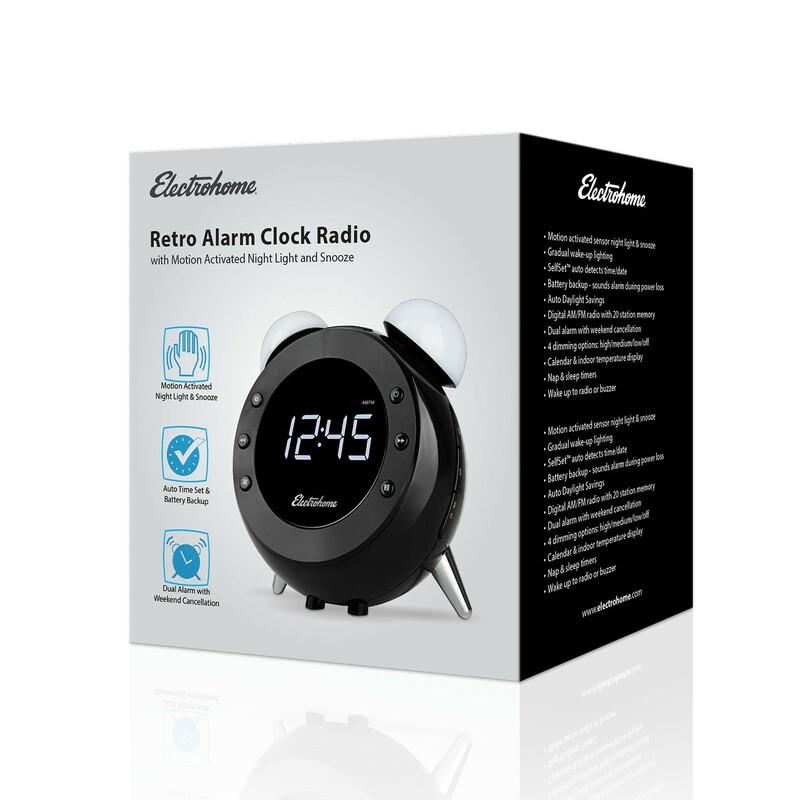 The Retro Alarm Clock comes complete with a collection of helpful features made to match its modern clock face, including: 4 display dimming options (full illumination to unlit), calendar and indoor temperature display, an easily programmable dual alarm with weekend cancellation that can be tailored to fit your weekly routine, the option to wake to buzzer or radio, and convenient Sleep and Nap timers. Clock is exact as picture very nice. So many issues... and its just a clock. 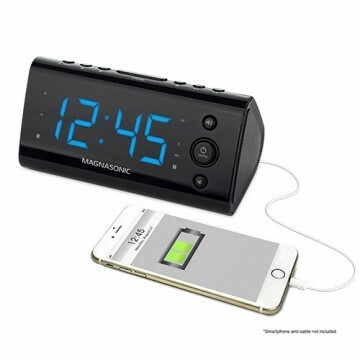 Never miss your alarm again. 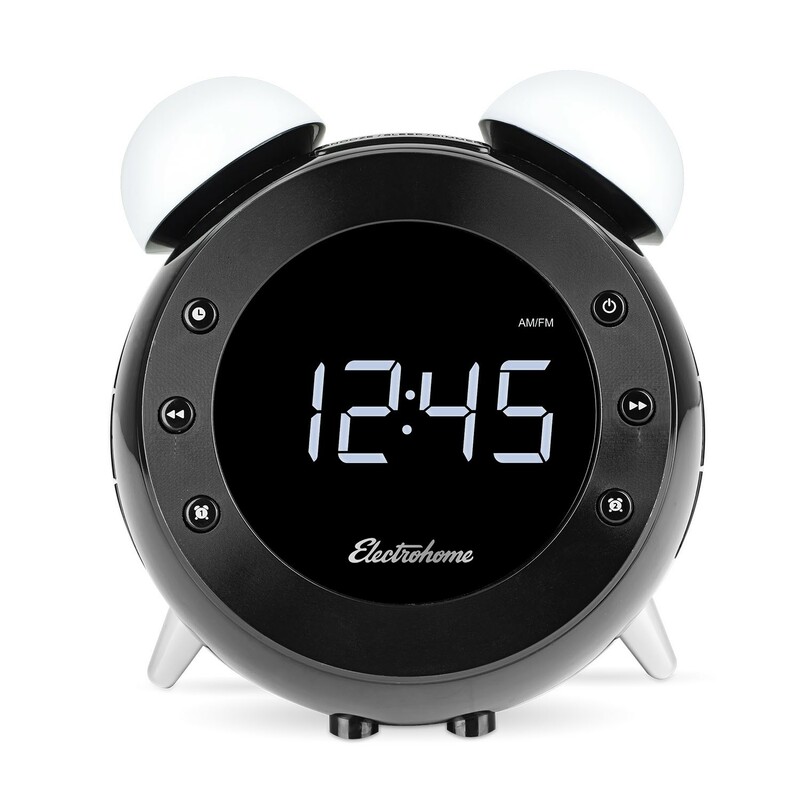 Really cool retro alarm clock radio. Lots of features. Good complete instructions. I would recommend this little clock to any one wanting a the cool retro look ! Personally I don't like it. Pros: Clock is pretty darn adorable, and I haven't gotten tired of being able to wave the light on and off yet. The display can be faded out or turned off entirely, and I appreciate that the alarm settings include light-level and sound volume. I do wish that there were one or two more alarm sound options. Cons: I keep coming in to find the lights turned on when I left them off, especially in the evening. I don't have an evening alarm set (I double checked), so I'm not sure what's triggering them (change in light level? something blowing around nearby?). Also, you do have to hold onto the clock in order to push the buttons on the front of it. Neither of those is a huge deal, and overall I'm happy with it.